Note: While this review will be spoiler free, it will make reference to previous books. If you haven’t started this series yet, check out VBC’s review of book 1, Throne of Glass. Running concurrently to the events of Empire of Storms, Tower of Dawn sees Chaol and Nesryn travel to the Southern Continent with two very clear, and possibly impossible, objectives: to secure an alliance to fight the Vlag king, and seek out one of the famous healers in the hope that Chaol may walk again. As newly appoint Hand to King Dorian, and an ambassador of Terresan, Choal soon realizes it’s going to be an uphill struggle to convince this vast continent’s royal family to go to war, not only in aid of kingdoms halfway across the world, but also against an enemy most still consider to be myth and legend. But while this court may present a united front, it soon becomes clear to Chaol that all is not well within its walls. When a dark force begins stalking those in the city, Chaol realizes that the enemy may have followed him across the sea. Tower of Dawn is the first book in the series to feature a different main character than Celaena/Aelin, and it has its own distinct flavor. While there are certainly action-packed moments, this is a much more character-driven story. Dawn sets out to work through all Chaol’s inner demons. I loved how much time Sarah J. Maas took with his character arc in this book, working through the pain and anger not just created by previous events, but some of Chaol’s own (pretty unpopular) choices. It was so interesting to see not only physical disability, but also mental health issues tackled in this fantasy setting, and I thought it was brilliantly done. It becomes pretty evident early on that the romantic elements in this installment weren’t going to be between Chaol and Nesryn (sorry if you were shipping these two, but don’t worry, Nesryn isn’t left out in the cold). Chaol engages in a battle of wills with his healer Yrene (yep, the barmaid from the novella The Assassin and the Healer). She has her own issues to tackle, and watching these two first aim all their animosity toward the world at each other and then slowly being to battle it together was captivating. While much of Chaol’s story is character based, there is still mystery and adventure, particularly toward the end of the book. But for the majority it’s Nesryn’s side of the story that brings the action and pushes the plot forward. It amazes me that six (technically seven) books in Maas can, and is, still expanding this world. The Southern Continent is as fresh and different as any of the other locations, and with it comes a whole host of new characters. The politics and dynamics were fascinating. It’s almost impossible to know whom to trust. Nesryn has been somewhat of a background character up until this point, but here she becomes fully fleshed out. Watching her discover her heritage and forge deep bonds, it didn’t take me long to become just as invested in her. 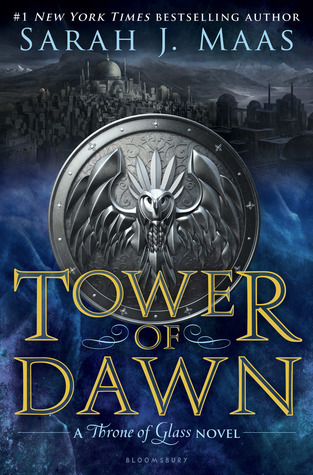 I have to admit, I wasn’t as excited about Tower of Dawn as I would normally be for a Throne of Glass release—especially since a switch from novella to full-length installment pushed back the final book. But here are three reasons why I was oh so wrong, and you should be excited: There are reveals and information in Tower of Dawn that are vital going into the next book. The Chaol I loved in the first two books makes his way back. This is some of Maas’ best writing, particularly when it comes to the romance. Everything that happens in Tower of Dawn only builds on the promise that the final installment is set to be epic. I totally agree with your review. I too wasn’t that excited about this novel, but quickly became swept up. I realized just how much I missed Choal, and it turns out I could read and enjoy a whole novel from his POV. I will admit that at times this did feel like an overlong novella, and I wasn’t as into Nesyrn. But oh Choal. I really liked Yrene too. Maas knows how to write a novel!